Legend here surrounds a large statue of a young girl and a cross. It is said that her apparition appears from the statue and drowns itself in Lac La Belle, or that her statue’s hands drip blood. Me and my best friend decided to go ghost hunting at the LaBelle cemetery in Oconomowoc. We ran into this group of teenagers from another school waiting for some of their friends to show up. The other friends showed up with an ouija board. My best friend’s family is really in touch with energy and the like, she’s definitely is a sensitive because she’s especially in tune with the supernatural, even though she isnt like a medium or anything. She said we needed to get out of there and that Ouija boards attract negative energy. So i agreed, and went with her back to the entrance. I felt drawn down this other path into this really unusually dark corner of the graveyard by the river. I talked her into walking down the path a little bit, but she said she felt like it was a really bad idea to go down there for some reason, and i didnt blame her, the darkness took on this really thick quality to it, and the air became really thick and oppressive. It became too much, so we turned around and we saw something strange. A dark shadow figure that looked like it was in a monk’s robe was smoothly gliding through the gravestones in front of some grave lights going towards where the kids with the ouija board were. The figure had a very malevolent aura, and was so black, it was like it was sucking all light into it, like a black hole. I instantly felt this wave of intense dread sweep over me. I turned to my friend and her eyes were wide and she was white as a sheet, she’d seen it too. We ran as fast as we could out of that place. I think i could also offer some insight into the identity of this entity. My house was built by the original owner of it back in the 1910’s and stayed in their family for two generations. The last generation of this family to live there had three kids, and when they grew up, one of them became a monk and moved to oconomowoc or something. He drowned in lac labelle. They found him by the shore by the cemetery, right near that dark corner i was talking about. This was a traumatic encounter and we both saw it. Since there is no phenomena like this reported to this website about labelle cemetery, i thought i should let you guys know what we saw. This is the exact same thing my friends and I saw. I froze, and I saw two very black figures. Exactly like you described, so black it was almost a black hole. They ran towards me, my friends weren’t in the view but they heard the footsteps. They sprinted towards us and after we ran out and turned around and saw the figures standing in the entrance, right before the gate. We all feel extremely sore now, an hour later. There’s something in this damned cemetery. First, I have lived in my home here in Oconomowoc since 1957 (since I was 6 years old). I live about a half a mile from the La Belle Cemetery which is actually on the Oconomowoc River, just a few hundred yards or so from the river’s entrance into FOWLER LAKE, not on Lac La Belle. Lac La Belle is about a mile or more away from the cemetery, across Fowler Lake and over one or the other of two dams. Fowler Lake and Lac La Belle are distinctly different lakes. The cemetery is simply named “La Belle,” but not (by any stretch of the imagination), ON Lac La Belle itself. As for the aforementioned “Monk” who supposedly drowned in Lac La Belle and his body found on the shore of the La Belle Cemetery: um, very tricky that dead monk, I have to admit. Since in order to have made it to the shores of La Belle Cemetery, the body would have had to actually float UP one or the other of two dams (both approximately 10 foot high), cross Fowler Lake, and then float upstream (against the current), on the Oconomowoc River to get there. But hey, we’re talking mystical forces here, so I’m sure there’s nothing special about corpses levitating up 10 foot dams to get where it wants to go. I’ll bet people living next to one of the dams (the other dam is in a city park), see plenty of corpses and other things levitating up the dam. I shouldn’t have even mentioned the problem of the dams. Mystical forces, man, mystical forces! What was I thinking. Lmao Santa DOES exist!!! Thank you SO much dear Santa for pointing out what any lifetime resident of Oconomowoc would know is pure malarkey in Hans’ story and doing so in a way which was very humorous but still factual. . Being raised on lake Nemobhin my entire life, I know the Oconomowoc area very well. Lac La Belle has no shore that touches the La Belle cemetery Hans, and yes that monk definitely has some skills. Maybe it’s also the “black monk” of Nashotah House lore, since I’ve heard that tale pretty much every day on my bus ride home from school when we’d have to drop kids off there to their parents who resided on the grounds. All sarcasm aside, I do believe there’s something after our last breath on earth, just please at least look at a map and get the facts correct as to which shore of which lake this monk washed up on to reach the cemetery o.k.? When i was there i saw her spirit and she was crying then she must have saw me because she ran towards me and diapered. Later i got pushed down the hill towards the lake but i smashed my back in to a grave then i saw her spirit again she was trying to pull me in to the lake once i got away i ran like crazy. i’v never came back i still haven’t and it happened three years ago. but ever since i was six i was able to see the paranormal i refuse to return to that place alone i would only go if there was at least two other people with me. What side of the lake? The cemetery isn’t on the lake; sorry. 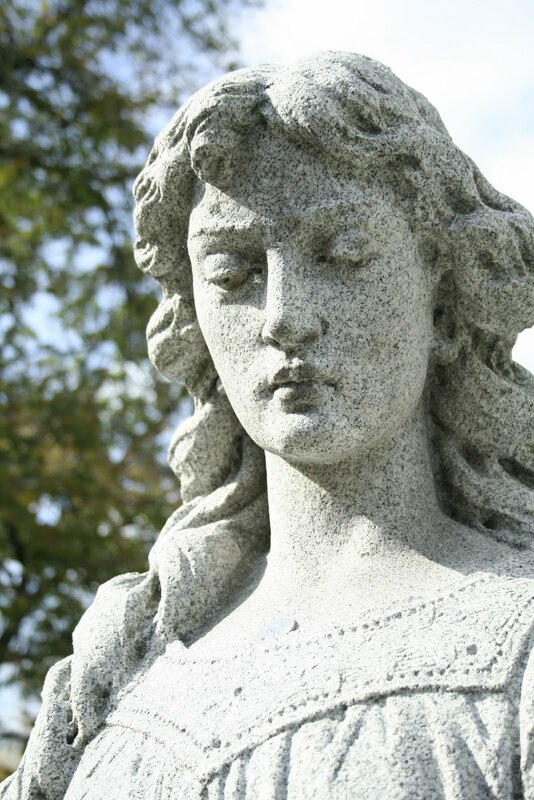 I visited the La Belle cemetary after reading about the ghost of Mary whom has been seen walking from the NAthisius family grave to the nearby water and drowning herself. Or the statue seen on this grave has also been seen walking to the water. Upon arriving at the cemetary we immediately started looking for the grave in question. Intersting enough the family buried at this grave has no relation to the Mary who has been said to have committed suicide nearby by drowning herself from a bridge jump. I didnt have any weird phenomina happen to me that day, but it was a chilling site to see pennies left on the statues hand and flowers as well. I havent been able to find any solid evidence of a drowning victim, but there are stories of a missing daughter not buried with the Nathisius family, as she was buried elsewhere. Possibly why the unrest? Definetly a beautiful cemetary to visit. The moseluem at the top of the hill has reported activity, we didnt see or sense anything the day we visited. I’ve left lived in oconomowoc my whole life. I’m 14 years old and love to go to that cemetery. Every time I go there I always get the chills. I always feel like someone is watching me. I go to that statue every time I go. Ive never seen blood but somethings not right when I go by her. There was this one one time when iI took a picture of a friend by an old family friends grave and if u zoom in a lot u can see a faint black face in the background. I should say that anyone should go there and investigate more. I love that Cemetery, I go there for solace. 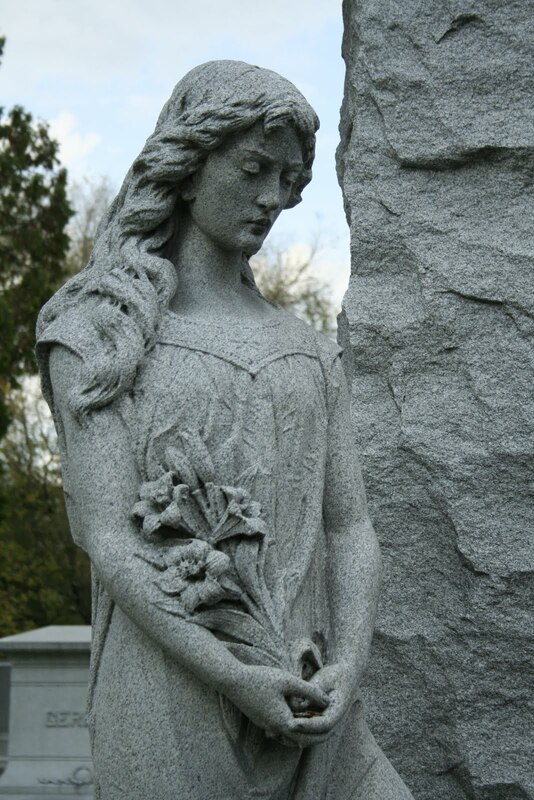 I absolutely get a feeling from the Nathusis statue and once saw a girl dressed in similar garb walking slowly into the river abutting the Cemetery…. but all in all, I sensed no evil, only peace and serenity. I love to go there when I am upset and need to cry, no one disturbs a crying person in a grave yard! Here is a picture of the beautiful statue! Same. I grew up in the area, and used to go here weekly. I’ve sat at the feet of this statue many times. I’ve always felt peace and calm during the day, but have had a handful of unsettling experiences at night. Regardless, this will always be a place I hold dear to me. I took this picture myself, so no releases need be signed to use this photo. Here is the beautiful face! from September 10 – 15 2010 a group of investigators and I spend days inside this cemetery. The results of the investigation. 5 days of EVP from several different locations came up with nothing. Night vision cameras surrounding the statue and river by the bridge came up with nothing. A history of the area shows no evidence of anyone drowning themselves in the lake or the stream. Over 3000 pictures turned up only a few anomalies. Orbs were easily discredited as bugs, there was a strange orange light easily discredited as a street light, and the only paranormal event noted was up on the hill at the mausoleum. Heard the sound of someone whispering from within, but not completely sure since recordings didn’t turn up with anything. I give the cemetery is creepy and beautiful but there was no evidence as to any haunting. There is also no evidence of blood dripping from the statue near the entrance. Teenagers that frequent the cemetery told our group that some people they knew put fake blood on statues to freak people out. Result of investigation is that there was no paranormal activity. EVP, EMF, Infrared thermometers, infrared film, hours of video and thousands of pictures turned up nothing. Many of the people that go into the cemetery already have the mindset that something is going on there which in turn tricks the mind into believing it. Sorry folks but I don’t feel that this cemetery is haunted. last year while taking a bike ride through the cemetery with my husband he went down one road and i was coming up another road. I saw someone standing in the middle of the road a little was down so I decided to go up another road so as not to disturb her but when I came to the place across from where she was standing she was gone!! No one else was around anywhere! She was wearing a long beige dress and had long brownish hair in curls…. I lived in Oconomowoc till I was 14. I am now 51. I still remember the story but think that all it is. No one I knew ever saw anything there. Not this cemetary, but another near country springs, my mom and her friend went to do something, i forgot what, and they were there and they heard a howl in the distance, my mom just thought it was a pack of wolves or some cyotes so they went on, about a minute later they heard it again, but closer this time, it was still quite a distance away, so my mom didn’t mine, they still went on, about another minute later my mom heard it again, this is when she started getting scared, but not scared enough, they still went on ANOTHER minute passed and she heard it again, closer, she got more scared but still, not scared enough, now about 30 second went by and it was literally in there face and now they could tell that it was a girl screaming. They quickly got back into the car and drove away. She never will go back there again (even though i want to) and believes the screaming girl still haunts the place. Near country springs? Do you know if it’s called tabernacle?? I have a distant relative buried close to the grave mentioned. I was there to mourn already so I went to mourn for the poor girl because local teens constantly mistreat the grave. My aunt lives nearby so it’s not out of the way at all. I would like to see some of the paranormal stuff for myself but I want to make sure I don’t disrespect the dead too. I’ve always lived in homes full of ghosts and they even have had local legends so I’m much more sensitive towards the dead than scared of them. Please keep in mind many hauntings are real dead people who can’t rest peacefully when you go searching for these types of legends!